The luggage net stops light items of luggage from sliding around the luggage compartment. The luggage net also has a built-in pocket with a zip that can hold smaller items. 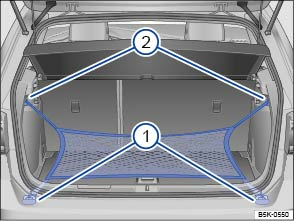 The luggage net can be attached in several different positions. Hook the luggage net onto the fastening rings . The luggage net zip must face upwards. Hook the luggage net onto the fastening rings . Hook the loop onto the bag hook . The fitted luggage net is held under tension . Remove the hooks and loops of the luggage compartment net from the fastening rings or bag hooks. Store the luggage net in the luggage compartment. 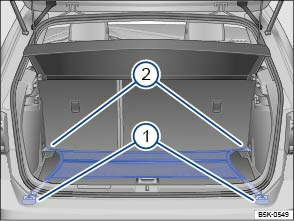 The elastic luggage net must be stretched when it is secured to the fastening rings in the luggage compartment. A fitted luggage net is held under tension. The luggage net hooks can cause injuries if the luggage net is installed or removed incorrectly. Always hold the luggage net hooks tightly to prevent them from falling out of the ring during installation or removal. Protect your eyes and face to avoid injuries from any hooks that may spring out during installation or removal. Always attach the luggage net hooks in the order described. If one of the hooks snaps back, the risk of injury increases.